Book now the best shore excursions in Hellesylt. High quality and safety at the lowest prices. If your are looking for Shore Excursion Hellesylt, book now the best guided tours at lowest price with Ancora Tours. Since 2003 we offer you official guides in english, transportation and travel insurance, all included. The highest quality at the lowest rates. Situated between towering mountains and a picture-perfect fjord is the village of Hellesylt. Against a beautiful natural backdrop, old farmhouses sit in seemingly random locations. The area is a UNESCO World Heritage Site and a must-see during any trip to Norway. Extra Fees: There are no extra fees in the shore excursion in Hellesylt. What’s eating: Sursild; pickled herring, often served on rye bread. Souvenir: Pewter ornaments and decorations. This shore excursion takes place in the old Viking port of Hellesylt. The village is situated in the stunning Norwegian scenery, hidden between mountains and fjords. We’ll head to Hornindalsvatn, the deepest lake in Europe, over 500 metres deep. The Hellesylt shore excursion then heads to Stryn, a village with a slightly busier feel. 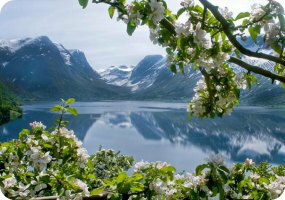 Here, we can admire the world famous scenery; snow-capped mountains run into glaciers and fjords. There are also many waterfalls and lakes to see before we return to port for boarding.